Star Wars Pictopia Trivia Game Only $14.99! Shipped FREE! You are here: Home / Great Deals / Christmas Deals / Star Wars Pictopia Trivia Game Only $14.99 Shipped! 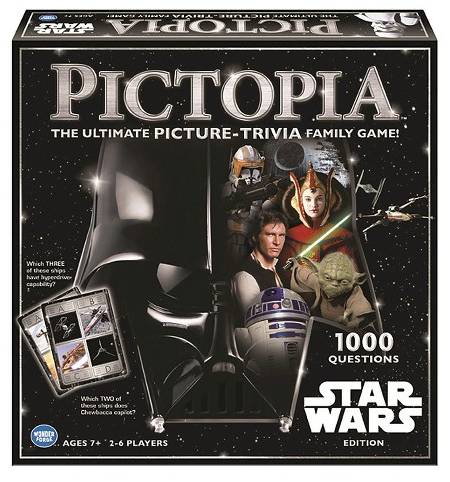 Star Wars Pictopia Trivia Game Only $14.99 Shipped! Star Wars Fans Make family game time epic with the Star Wars Pictopia Trivia Game, exclusively at Target!! Order the Star Wars Pictopia Trivia Game for Only $14.99! Shipped FREE or opt for in-store pickup! Prove whether you are a Padawan or Jedi Master when your knowledge of Star Wars is tested with 1,000 questions on the iconic planets, ships, villains, and heroes from a galaxy far, far away. It’s a game of teamwork but with a competitive edge! Sometimes you’ll work together and other times answer alone, but you’ll wager every time. How much you risk depends on how well you know your Star Wars trivia! Feel the Force questions add an exciting twist by revealing how much you sense about other players. Become a true Jedi Master with the Star Wars Pictopia trivia game!